In case you were wondering what classes I'm suffering through taking this fall term (they started Monday! ), here is a list as well as a short synopsis from the school catalog. 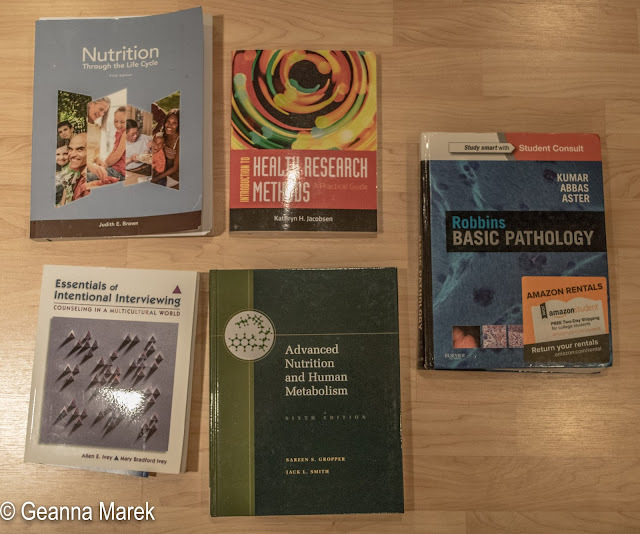 Bastyr University focuses on a whole-foods curriculum instead of individual nutrients, which is what drew me towards the school to begin with, but I've heard from second-year MSN students that during the first two terms, it doesn't really feel like that's the case. I'm a little apprehensive about this term, but I also know that I've made it this far and have gotten A's in my hardest classes (organic chemistry, A&P, biology, and biochemistry, to name a few), so I should be able to succeed this term, as well. If you'll notice, that's a total of 17 credits, and 5 classes plus two (non-science!) lab periods, which is the most I've taken in one term since my undergraduate degree. Needless to say, you won't be seeing much of me here on the blog for the next few months! Here's my pile of required books for this term. Lovely, eh?